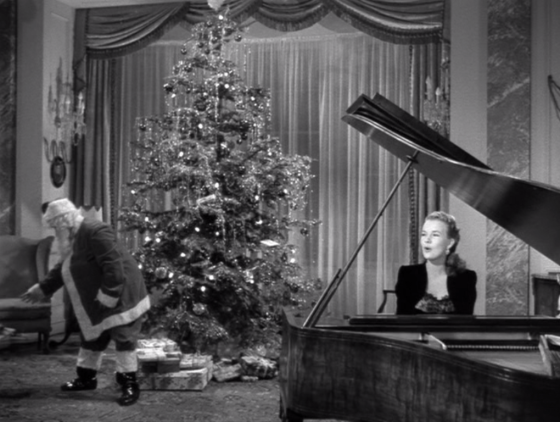 Capra himself was scheduled to direct it back in 1945, but instead he chose to make another Christmas film you may have heard of, IT’S A WONDERFUL LIFE. 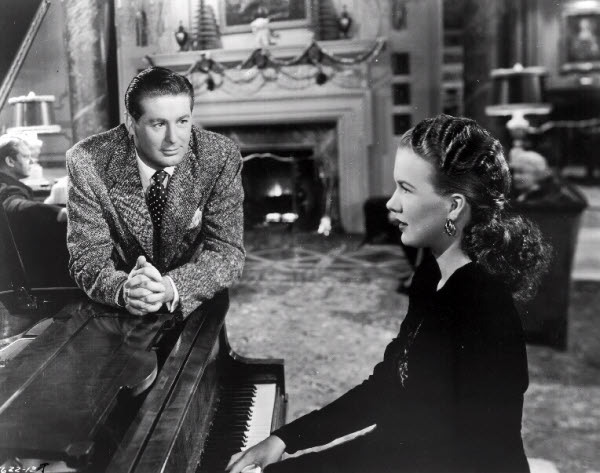 Veteran Roy Del Ruth obtained the rights, and IT HAPPENED ON 5TH AVENUE became the first release of Allied Artists, the larger budgeted, more prestigious arm of Monogram Pictures (and you know how much I love Monogram movies!). The film was cast, shooting began, and the movie was released- in Easter season! I’m not quite sure why a movie based around the Christmas season was released on Easter, but it didn’t matter, as moviegoers packed their local theaters, and Allied Artists had a huge hit on their hands. The story: When “industrial wizard” Michael J. O’Connor, “the second richest man in the world”, goes south to Virginia during the winter months, hobo Aloysius McKeever and his dog Sammy appropriate the property. McKeever meets Jim Bullock, a homeless vet evicted from his room because O’Connor bought his building to put up another skyscraper. McKeever invites Jim to stay with him until he gets settled somewhere. O’Connor’s headstrong 18 year old daughter Trudy, still depressed over her parent’s divorce, runs away from boarding school and heads to the family mansion. She’s caught by McKeever and Jim, who think she’s a thief trying to steal a mink coat. When she overhears the two talking about the reason they’re in her home, she plays along, calling herself ‘Trudy Smith’ from Dubuque, Iowa, one of fourteen children with an alcoholic father who beats them all regularly. Trudy falls for Jim, and while they stroll down the street they run into a couple of Jim’s old Army buddies, Whitey and Hank, and their families, currently all living in their car due to the housing crisis. Soon all nine people are squatting in the O’Connor homestead, and Jim comes up with a plan to turn a former Army camp into housing for homeless veterans. O’Connor tracks down Trudy, but she persuades pop into playing along so Jim won’t think she’s a spoiled little rich girl. He does for a time, but soon gets fed up with the situation and threatens to call the police, forcing Trudy to call mom Mary in Palm Beach, who arrives and gets in on the charade by posing as an Irish cook! Got all that so far? Good, but there’s a catch: unbeknownst to each, O’Connor is bidding on that same Army property as Jim, causing more complications. But you just know everything’s going to work out in the end; after all, it’s a Christmas movie, and that’s what Christmas movies do! Producer/director Del Ruth wraps things up neatly with a bow on top, and screenwriter Everett Freeman sends us all home happy in the end (his script lost the Oscar to another Yuletime classic that year, MIRACLE ON 34TH STREET!). 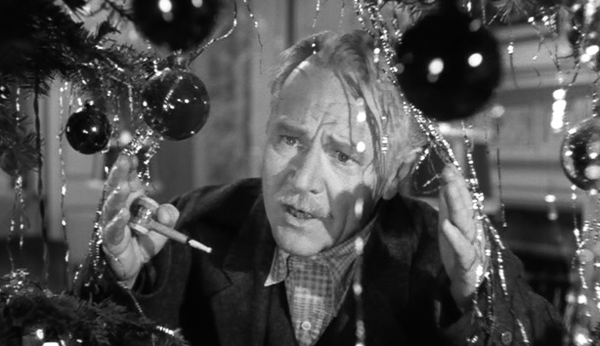 Victor Moore gets top billing as McKeever, a gentle soul of a hobo who’s wiser than his outward appearance lets on. Moore was a star of Broadway and early silent flicks who became a reliable character actor (GOLD DIGGERS OF 1937, SWING TIME). He’s definitely an acquired taste, but is more than acceptable here. The young lovers are well played by Don DeFore and Gale Storm . I’ve told you about my long-time crush on Miss Storm here through viewing reruns of her sitcom MY LITTLE MARGIE. Gale had a lovely singing voice to boot, but for some reason Del Ruth chose to have her dubbed! Doesn’t matter, Monogram’s home-grown starlet shines anyway as Trudy. It’s Charles Ruggles who really made the film for me as the millionaire O’Connor. 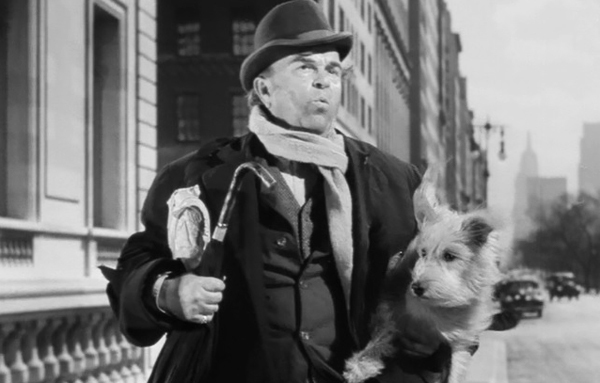 Ruggles’ facial expressions, vocal inflections, and willingness to take a pratfall or two are a joy to behold, and the veteran comic character star walks away with the movie’s acting honors. Pre-Code darling Ann Harding (HOLIDAY, THE ANIMAL KINGDOM, THE LIFE OF VERGIE WINTERS), always a welcome presence, has terrific chemistry with Ruggles as his former spouse. Young Alan Hale Jr (Gilligan’s Skipper!) 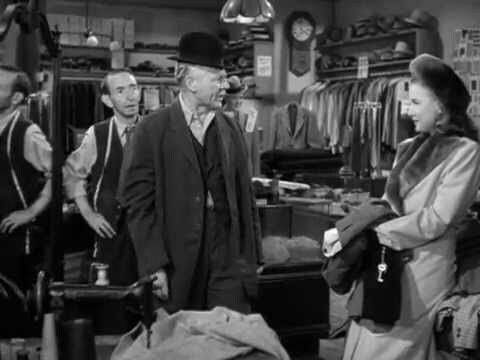 plays Jim’s pal Whitey, and Dorothea Kent (a lovely lass) is his wife. Other Familiar Faces joining in on the fun are Leon Belasco, Edward Brophy, Chester Clute, Dudley Dickerson, James Flavin, John Hamilton, Charles Lane, George Lloyd, and Grant Mitchell. 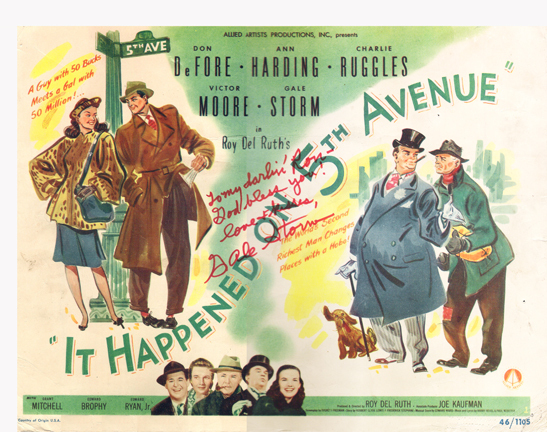 IT HAPPENED ON 5TH AVENUE will be on my Christmas watch list from now on, a delightful screwball tale the whole family can enjoy. Tired of the same old holiday movies? Give this one a try; you can thank me later! Nice review! This really is an enjoyable little gem… Saw it a couple of years ago on Warner streaming and need to revisit it. Hopefully others will discover it!